Tributes have been paid to Tony Pickering, the cyclist who was killed in an accident in Northampton yesterday morning. Mr Pickering, aged 52, of Gayhurst Close, Moulton, was killed after colliding with a people carrier. He was taken to Northampton General Hospital with serious injuries but later died. 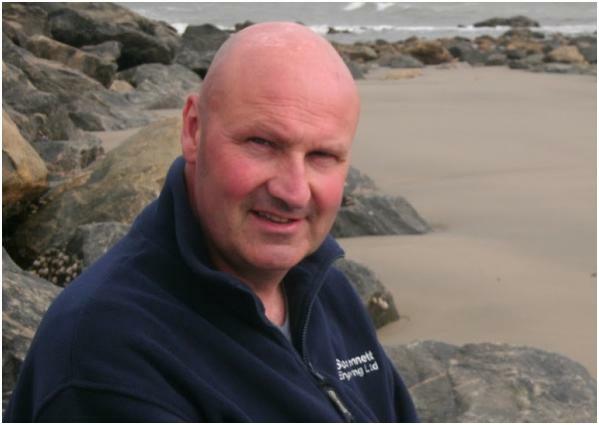 A work colleague has described Mr Pickering as a “great character” who will be “sorely missed”. Mr Pickering had worked on and off for Scot Bennett Engineering Ltd, in Horsley Road, Kingsthorpe for about 25 years. He joined the company from school in 1977 and worked there until 1988, and returned to work for them in 1999, remaining there ever since. Rob Bennett, director at Scot Bennett Engineering Ltd, said: “It was shocking yesterday. To lose some so suddenly affected everyone here. “He will be sorely missed. He was a great character and we are all shocked and saddened by his tragic death. “He was a very good engineer. But we considered him a friend as well as a colleague. A 39-year-old Northampton man, arrested on suspicion of causing death by dangerous driving, has been released on police bail pending further enquiries. Everyone is very welcome – hope to see you there! One of the more exciting plans we have for this year is a short visit to a fellow organisation in Aachen, Germany – to meet with the local member group of the ADFC (Allgemeiner Deutscher Fahrrad-Club or German Cyclists Federation) – to see how they do things over there. We have a programme of rides to take us over there and back (with a little assistance from boats and trains), and a small selection of rides to participate in whilst over there. We are also planning to spend some time seeing how German cycling infrastructure and rights stack up against ours. There is a possibility of some homestay accommodation in Aachen, although this is rather limited. There is plenty of other accommodation in the area, including a campsite. Outbound riding dates: Wednesday 17th April & Thursday 18th April to reach Aachen in the late afternoon. We are planning to muster at Dover docks at 10.30 a.m. on Wednesday 17th April for the noon crossing to Dunkirk. We will pedal from Dunkirk to Ostend (45 miles) and stay overnight in Ostend. On Thursday 18th April we will take the train from Ostend to Liège and then pedal from Liège to Aachen (40 miles). In Aachen: Friday 19th April, Saturday 20th April, Sunday 21st April. Return riding dates: Leave Aachen early on the morning of Monday 22nd April, either pedalling or taking a local train to Liège. We will then take the train from Liège to Ostend and pedal to Dunkirk. We will stay overnight in Dunkirk, catching the 10.00 a.m. ferry on Tuesday 23rd April from Dunkirk to Dover. Rides are planned in Aachen for both the Saturday (led by the local group) and the Sunday (led by former ADFC’er Philip Gray), with Friday being set aside for tourist sights, seeing how the ADFC operates, discussing German cycling policies and, perhaps, a visit to the famous Thermal Baths. Friday: Free morning to visit the cathedral and city centre, a World Cultural Heritage Site. Afternoon visit local ADFC office in the Welthaus to see their operation and to meet their full-time intern, Karin. Saturday: In the morning, either tour the city’s key cycling infrastructure or join the ADFC “sporty” ride. In the afternoon, join the ADFC “leisure” ride to Dreiländereck (“Three Country Corner” – the spot where Germany, Belgium and Holland meet.) In the evening, we will host our ADFC friends at a local restaurant. Sunday: Philip Gray will lead a day ride to Monschau in the Eiffel. Of course, you are free to join us for part or all of the week, but we have reckoned that the cost of the whole week, following our riding plan, to be approximately £350 – £400. That includes the costs of ferries, trains and hotels en route, plus meals and other incidentals, from Northampton to Aachen and back. It does not include the cost of accommodation in Aachen itself (see below for why). Of course, your own costs may vary. Philip Gray and his contacts in Aachen have kindly agreed a deadline for homestay requests of February 28th – the day after the Slideshow at Park Avenue Methodist Church. If you are interested in this option, and have not already emailed Phil, do so before the 28th or come and talk to him at the Slideshow. Hotel accommodation is not difficult to find in Aachen, there is a camper-van site within the city and a pleasant-looking campsite about four miles away across the border in The Netherlands so you have options other than homestay if you so wish. Whether you choose to ride with us there and back, or just meet us there for the Friday, Saturday and Sunday, let Philip Gray (01604 720522) know your interest as he’s collating this. Philip lived for some years in Aachen, where he was a member of the ADFC. This is not an organised or led tour. 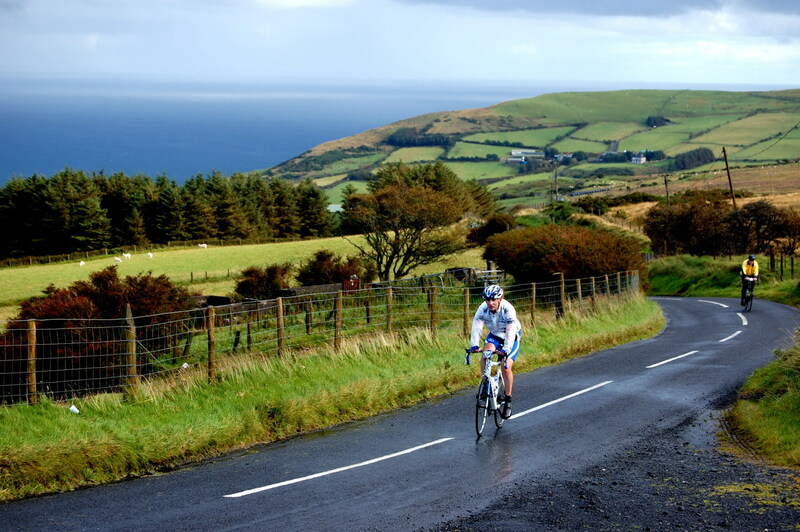 Riders are responsible for making their own arrangements for accommodation, ferry crossings and train tickets. Riders are responsible for their own passports, EHIC cards, and insurance. Bring lights, spare batteries and/or a charger. Don’t use flashing lights in Germany! French law requires hi-viz clothing, e.g. a jacket or waistcoat, outside built-up areas at night or in conditions of low visibility. Please do a “test run” – a fully-laden ride – with the gear that you are planning to take mounted to the bike in advance of the visit. This Saturday we will be meeting at Moulton Co-op at 2.00 p.m. for a short leisure ride down the east side of Northampton. We will go through Ecton to Beckworth Emporium for afternoon coffee, before returning to Moulton. There may be a very short walking section. As usual at this time of year, we will be keeping an eye on the weather. Although we should be back comfortably before sunset, lights might be an idea if the sun isn’t too bright. On a beautifully sunny morning, nine riders gathered at the Brampton Valley Way (BVW) crossing with the A5199 at 9.30 a.m. (and a tenth was waiting for the group at the Waterloo Farm Café). Iain D, Brian, David, Eleanor, Phil L were joined by Malcolm, Hartley and Vikki – these three being guest riders out to see what we were like. Bill was waiting at the café. I had chosen, in retrospect a bit of a leg-stretching ride: only 45 miles but plenty of bumps. I had no excuse, having recce’d it only two days earlier. Before elevenses,the high spot (literally) was pausing at Naseby Church. Every route in to Naseby seems to involve a considerable climb. But the sunshine and the company made it pleasant work. We reached the café – at 18 miles – at 11.15 a.m. I’d booked a table for eight at the Foxton Locks Inn and, by phoning ahead at this stage, was able to increase it to ten. Through East Farndon (downhill for once – as Iain noted) and Lubenham was delightful. We reached the locks at 12.30 p.m. The inn was fully booked for lunches, and there was a queue – so it was good to have a table set for ten waiting for us; and a helpful waitress bringing us drinks and meals. Everyone claimed to have enjoyed the route but, as a distinguished music critic once said that an orchestra is nothing without listeners, so a planned route is nothing without riders. My thanks are heartfully felt to my nine fellow pedallers. I hope that Malcolm, Hartley and Vikki join us again. I’m glad I left my recce to the last minute. Today was the nicest biking weather for quite a while. Start from the Brampton Valley Way near The Windhover at 9.30 a.m. Elevenses at Waterloo Farm Café. Lunch at Foxton Locks Inn. Return to The Windhover. Out via Holdenby, Spratton, Creaton, Cottesbrooke, Naseby and Clipston to Great Oxendon at the Waterloo Farm Café .Don’t be alarmed by the A5199 between Spratton and Creaton; we’ll use the dual-use path on the eastern side. On via East Farndon and Lubeham to Foxton Locks. Return via Theddingworth, Sibbertoft, Naseby, Guilsborough, Teeton and Holdenby to The Windhover. There’s a short stretch of A road (the A4304) just before Theddingworth; it’s about ½-a-mile and the only A road on the whole day. That makes it a very narrow figure-of-eight centered on Naseby. As I was a history teacher for forty years, I can’t get enough of Naseby. One of the three most important battles in English history! (The other two being the Battle of Hastings and the Battle of Britain.) Riding the area on a bike is a close to seeing the view from 17th-century horseback as you’ll ever get. You appreciate why, at dawn on the day of the battle, both sides raced to control Naseby church with the view from its spire. Fairfax’s own view on the ground is magnificent enough! Some may want to join us at Waterloo Farm. Some may want to say goodbye at Foxton Locks. Timings: if we leave The Windhover at, or shortly after, 9.30 a.m., we’ll reach Waterloo Farm at approximately 11.00 a.m. A table is booked at Foxton Locks Inn at 12.30 p.m. If we leave Foxton Locks at, say, 1.30 p.m. then we’ll be back at The Windhover at 3.20 p.m. If anyone needs afternoon tea, then Seatons at Guilborough will be open and serving hot drinks, although I was given the impression that hot drinks would be from a machine. Certainly the café space there is much reduced since I last visited. I got the impression it was under new owners. We’ll be in Guilsborough at about 2.40 p.m. Distance: just over 45 miles. Route on Endomondo here. 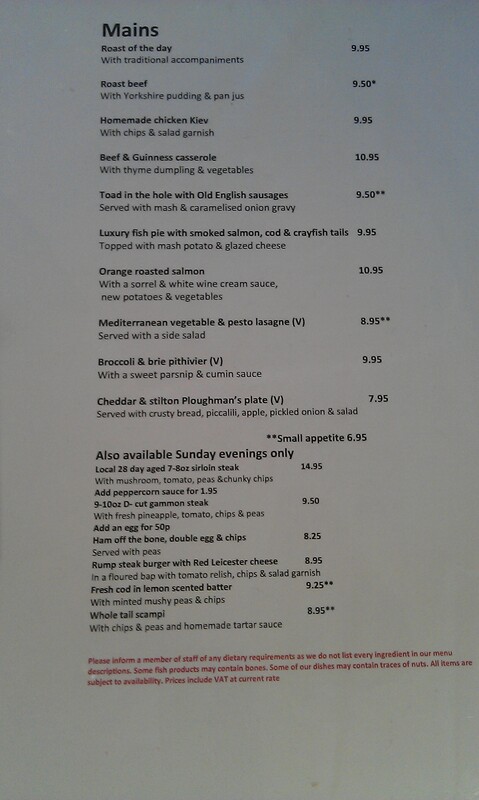 Here’s the Foxton Locks Inn’s menu for Sunday. 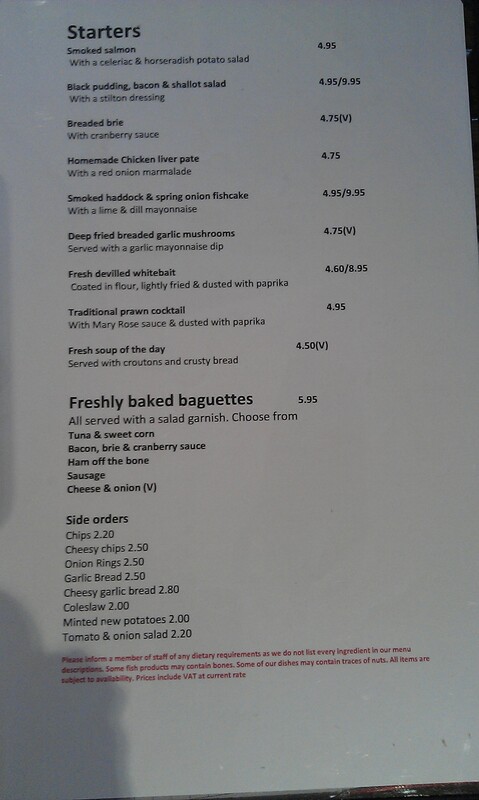 There’s a range of roasts and Sunday dinners at one end, with filled warm baguettes at the other end. Today, I had a pint (of very good real ale) and a filled baguette. I hope to see lots of you on Sunday morning! This Sunday’s ride is to the north, just into Leicestershire. Start from the Brampton Valley Way, near The Windhover, at 9.30 a.m. Originally, I had intended (and it’s advertised in the rides list as such) to get to Saddington for lunch. The Queen’s Head, unfortunately, has just been taken over by new management. Well, that’s not unfortunate; it’s just that they closed their kitchen and are re-opening to serve food next Sunday (24th). So I’m proposing to make Foxton Locks our lunch stop. Return via Sibbertoft, Naseby, Guilsborough, Teeton and Holdenby to our starting point. I should tell you that I’ve still to ride a recce! Apologies! I had planned to do it in January – but found the weather and a hectic social life put the kybosh on that. I had planned again for this Monday or yesterday but I chickened out again for weather-related reasons. Tomorrow is Valentine’s Day and I’m a romantic and so I’m now planning my recce for Friday! It should be milder!! The BBC website is predicting cloud and sunny intervals for Sunday itself, with temperatures up to 7° which is a little more normal.